Home»Alpine Meadows Resort, Blog»Why Glamping? Alpine Meadows’ luxury glamping tents offer guests the relaxed recreation of camping with the welcome comforts of a first class resort. Experience the awe-inspiring nature that surrounds us here at Alpine Meadows. Wells Gray Park and nearby Clearwater offer endless opportunities to experience our natural playground. Hike to the waterfalls; paddle the lakes; watch the animals in their habitats; photograph the wildflowers; gaze at the stars in our clear and unpolluted skies. At Alpine Meadows, there’s no limit to the ways in which you can take in the majestic beauty of this land. Really, really comfortable beds. You’ve spent the day exploring, now give your muscles a much-needed rest on a dreamy mattress covered in fresh, comfortable linens. Wake up refreshed and ready for another day of amazing! 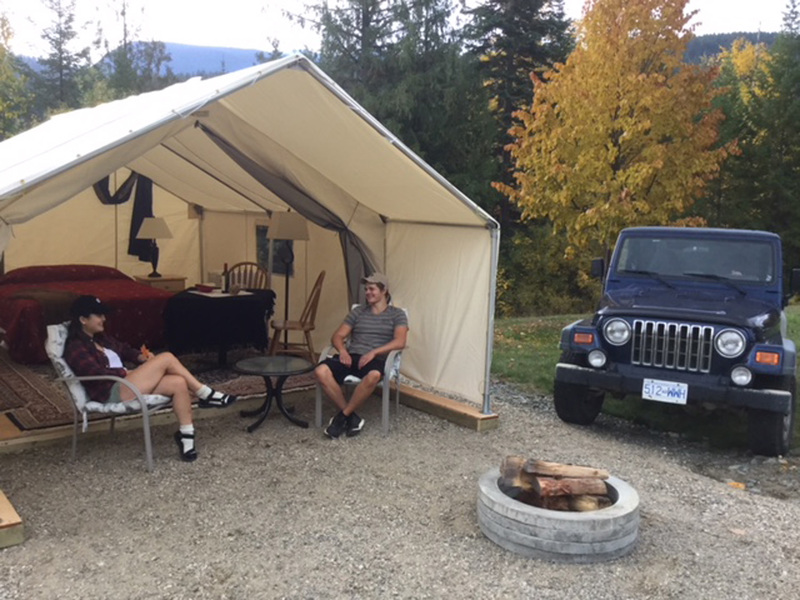 At Alpine Meadows, our Glamping guests have access to all of our resort facilities, including the relaxing lakeview jacuzzi, boating and fishing rentals, the activity centre, laundry facilities, and WiFi hotspots. Our upscale, clean, and comfortable washroom facilities are a welcome luxury, as well. Camp in style and comfort, here! Our fresh, locally-sourced, gourmet meals, served on our inviting Lakeside Patio, are a significant improvement over campfire-cooked meals. What a treat to indulge in at the end of the day! And if you’re so inspired, you’re still able to enjoy some late-night s’mores as you gather around your private propane firepit! Spending time with your loved ones, going on wild adventures, having new experiences, and collecting wonderful stories. These are the best things about spending time here at Alpine Meadows. There’s a sense of feeling whole when you spend time in nature (even under a beautiful tent!). A visit here will stay with you forever. Glamping is a fantastic way to enjoy all of the benefits of an easy, natural vacation, without waking up with a sore back! Plenty of elbow room, welcome luxuries, and no need for bear bags. Alpine Meadows is the perfect place to start your BC Glamping adventure. Reservations in our glamping tents are limited. Contact us early to reserve your spot. We look forward to seeing you this season!